I spoke on February 10 at the University of California-Berkeley to a crowd of about 550; a sizeable number could not get in. As I had expected, this was the most out-of-control talk of the roughly one thousand I have given, with a core group of about 150 Islamists, Palestinian radicals, and far-leftists constantly disrupting me, mostly with insults that I would prefer to forget. 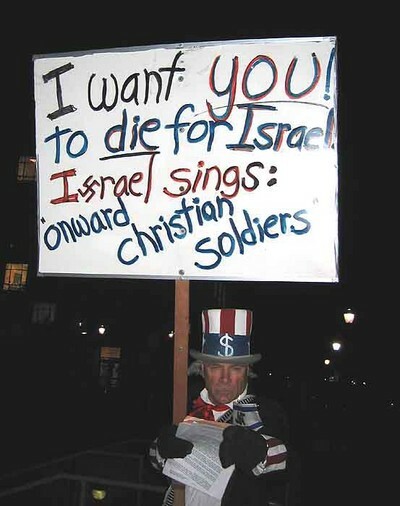 A demonstrator outside the UC-Berkeley hall where Daniel Pipes spoke. The best and fullest account of the event is by Cinnamon Stillwell, "Fascism at UC Berkeley: Muslim Student Association Disrupts Daniel Pipes Lecture," at ChronWatch. There are over 200 comments on it – some from persons who attended the event – at "Daniel Pipes at UC Berkeley," LittleGreenFootballs.com. (For first-hand accounts, see comments #27, 28, 86, 94, 107, 125, 126, 135, and 214) One person ("zombie") has posted pictures of the event. (For zombie's narrative of the pictures, see #145 at the LittleGreenFootballs.com site.) In addition, the school paper, the Daily Californian, covered the event in an article titled "Staunch Israel Backer Attacks 'Militant' Islam." A picture from "zombie" with the caption "one of the many times Daniel Pipes was interrupted by protestors inside the lecture hall." The videotape that my hosts were supposed to make of this event did not happen, so before commenting in any depth on what happened I am waiting to get hold of one of the several others made that evening. For the moment, suffice to say that the vice-chancellor of the university present at this event, plus the UC police arrayed at it in large numbers, both showed weakness in permitting the disruptors to dominate. I should not have been subjected to this treatment. To make matters worse, none of the offenders was arrested. I shake my head with dismay at this; and a second time on recalling that UC-Berkeley is a taxpayer-funded institution. "Time to Take a Stand Against Campus Terror," a blistering editorial from FrontPageMag.com focuses on the culpability of UC-Berkeley's administration for allowing such disruptions to take place and makes this important point: "Both of the Islamo-fascist organizations that disrupted the Berkeley event – the Muslim Students Association and Students for Justice in Palestine – are officially recognized student organizations funded by student fees. There is no excuse for funding organizations who are self-declared enemies of the free exchange of ideas. The University of California needs to suspend both offending groups and withdraw their funding." "The Pipes Speech," by Lee Kaplan of dafka.org, also at FrontPageMag.com. Kaplan focuses on the content of my talk. "Raucous crowd lays into Mideast pundit Pipes at U.C. Berkeley speech," by Joe Eskenazi in J, the Jewish weekly of San Francisco. "Firebrand Theater: Daniel Pipes as a cool medium," a long, strange, impressionistic piece, looking almost exclusively at the audience reaction, by Tim Cavanaugh of the libertarian magazine, Reason. In addition, the national campus director of Students for Academic Freedom, Sara Dogan, wrote an open letter to the vice chancellor of UC-Berkeley, John Cummins (who, as I noted above, was present at the talk). It's interesting to note that my opponents appear not to have written anything on this incident; I guess it's not exactly something they are proud of. Sanne DeWitt's letter to the editor of "J"
I would like to respond to your inquiry about the recent lecture of Daniel Pipes on the campus. 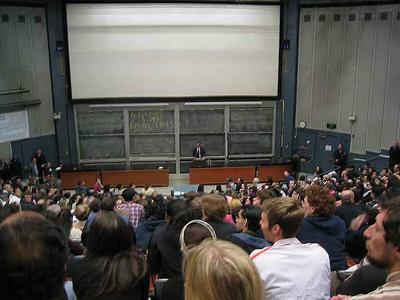 The University faculty or some student groups occasionally have invited controversial speakers to the campus. We believe it is important to have all points of view expressed, regardless of the likelihood of criticism that ensues from those who hold opposing viewpoints. When Daniel Pipes was invited by Hillel to speak, we anticipated that pro-Palestinian students would use the occasion to protest, and we planned accordingly. When we hold an event on campus that we can reasonably anticipate will produce heckling and potential interruptions, our purpose is to assure that the speaker is able to deliver his or her message and complete his or her speech. We can neither insist that only those who agree with the speaker attend, nor can we silence those who attend and disagree with the speaker. We can and do require that anyone who interrupts a speaker leave the event, if necessary at the insistence of the police. We took such action at the Pipes speech. "Throughout the speech, a handful of loud commentators were escorted outside by the police, and a large faction of Pro-Palestinian students made a dramatic exit toward the end of Pipes' speech. Pipes' supporters often shouted back for those students to listen. And somewhere in between, the moderate Jews, Muslims and community members said they found little resonance in Pipes' words and even less of an opportunity for real discussion." Did the campus meet its obligation to preserve the right of a speaker to present his or her message? I believe it did. The article from The Front Page [Magazine] concludes with the observation: "The audience gave Pipes a standing ovation with loud cheers at the conclusion of his speech." Uncivil behavior, lamentable as it is, is not a crime, nor is it a violation of the Code of Student Conduct. No matter how ugly and hurtful may be the comments of those who dissent from the opinions of the speaker, those comments are also protected by the First Amendment, and they are punishable only when those who make them refuse to leave when asked to do so by the police. I do wish to take exception to Mr. Pipes' comments about the Muslim Student Association at Berkeley and our Center for Middle Eastern Studies. He implied that funding for these organizations can be linked to terrorist groups and that funding originating in Saudi Arabia for the Center for Middle Eastern Studies somehow corrupts the research conducted there. Such allegations are inaccurate, without foundation, insulting, and intentionally provocative. I hope you can appreciate how difficult these situations can be, how important it is for us to respect both the rights of speakers and the rights of dissenters. We are not perfect, but I submit that, on the whole, we handle it reasonably well. About the UC-Berkeley Center for Middle Eastern Studies: I advise him to read Martin Kramer's analysis of the corrupting effects of Saudi money. Before labeling my words "inaccurate, without foundation, insulting, and intentionally provocative," Mr. Berdahl would do well to do just a smidgen of research. That used to be, anyway, the sort of thing that universities engaged in. Feb. 29, 2004 update: Jeanie Kennedy has posted an interesting account of the event. May 19, 2004 update: Emeryville's East Bay Express has a long and unexpectedly sympathetic cover story by Anneli Rufus titled "Berkeley Intifada: As students embrace the Palestinian cause, UC Berkeley has lost whatever reputation it may once have had for tolerance," in which my talk features prominently. June 30, 2004 update: Sara Dogan's letter to Vice Chancelor Cummins was noted in the Feb. 17 update above; today, she posts her entire correspondence with Mr. Cummins, with commentary, under the evocative title "Coddling Campus Fascists." on the evening of February 10, 2004. I was walking through the University of California campus in Berkeley, when by chance I passed by a building with a large crowd of people in front, apparently waiting to get inside to attend a lecture. But something was odd -- various people in the crowd were screaming at each other. I also noticed that there were a lot of people wearing kaffiyehs and hijabs, and also people wearing yarmulkes. I stopped to watch for a while, and all the arguments seemed to be about Israel, terrorism, Islam, and so on. I asked someone what was going on, and they told me they were protesting an appearance by [foreign policy scholar] Daniel Pipes, who was scheduled to speak in just a few minutes. Now, at the time, I had never heard of Daniel Pipes. On a whim, I decided to stay since I had my camera with me that day. I recorded the arguments before the lecture, the disruption of the event itself, and the threatening behavior of the anti-Israel crowd afterward. I figured out how to make a second Web page on my user site, and uploaded the pictures. This time, the response was explosive: various blogs themselves made posts out of my pictures, and linked to my page. I got tens of thousands of visitors within a few hours of putting the pictures online. Generally, most people's blog entries at that time were simply a re-posted newspaper story, or a free-form rant. I discovered then that people were hungry for "original content," the raw meat of newsmaking. That was the day when I truly emerged as "zombie" -- February 11, 2004, when my Pipes photos first got noticed by thousands of people. I experienced a "paradigm shift," to use the technical term. From that day on, I fully embraced my "zombie" persona and went to document political events whenever I possibly could. 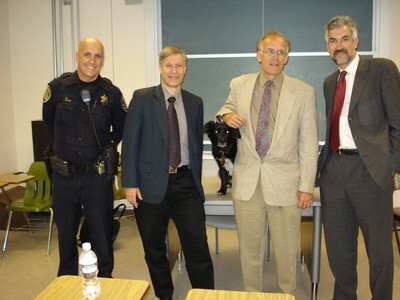 A UC-Berkeley police officer and his sniffer dog pose before the event with the three panelists, from left, Yaron Brook, Victor Davis Hanson, and Daniel Pipes. Jan. 15, 2009 update: Blogger Jolie Rouge notes at "A speech-free bubble around Bill Ayers" the contrast in policies by university administrations for William Ayers, unrepentant terrorist, versus that meted out to Michelle Malkin and myself. When Ayers spoke recently at Florida State University, the campus police moved protestors from the building he was to speak in and corralled them in an Orwellian-sounding "free-speech zone." Jolie Rouge contrasts this delicate treatment with the roughing up of audiences at Malkin's and my talks at UC-Berkeley, with pictures. Comment: This fits a pattern which I already pointed to at "John Esposito's Very Special Security," whereby those favored by the school administrators benefit from a security coddling that we who are not do not. I attended a Daniel Pipes' lecture at UC, Berkeley a number of years ago. To get into the lecture, we had to pass through airport-type security. A phalanx of police surrounded the interior of the hall. A safe room had to be set aside for Pipes and an exit strategy had to be created to get to it. The lecture was punctuated with verbal and physical disruption. Pipes had to stop while police ejected the most confrontational protesters. After the lecture, we had to exit nearly single file through one door. Waiting for us outside was a gamut of Muslim students and their leftist sympathizers, who shouted in our faces and spat at us. We offended them. We dared to avail ourselves of the right to assemble guaranteed us under the First Amendment to the U.S. Constitution.